I was in San Diego with the family on Spring Break, visiting with my mother-in-law who lives near Escondido. After a long drive from San Jose the previous evening, I took off in the morning for a few days out in the Anza-Borrego desert region on the county's east side. My first stop was just outside Julian for a hike in the Volcan Mtns. I had come here to hike in the wintertime once, only to find the area closed, due to concern for muddy trails and the like. Springtime seems to be more welcoming, though today started off more like winter. Clouds covered much of the sky and temperatures were frosty at the start. Volcan Point is the highpoint of the Volcan Mtns Preserve, a lovely park managed by the San Diego County Parks and Recreation Dept. The park is open 7 days a week starting sometime in Spring, but the upper half is open only on weekends, something I didn't discover until visiting the park. 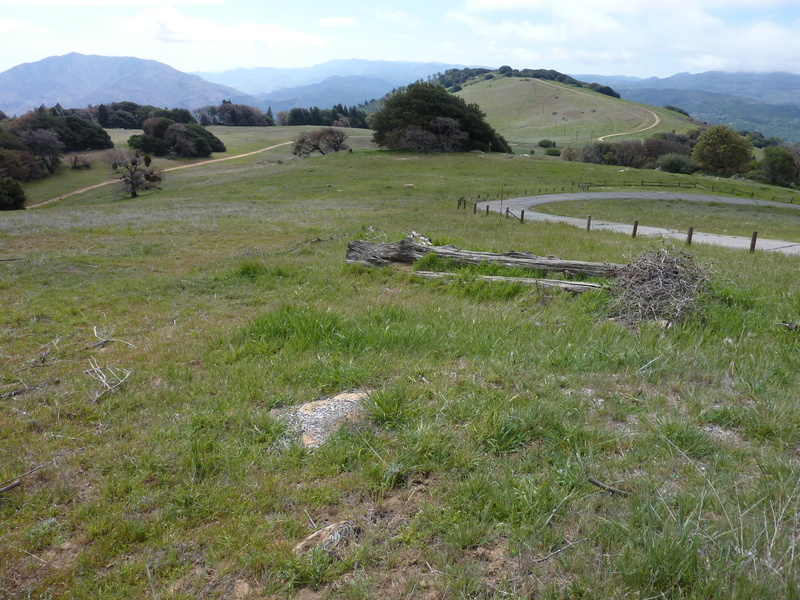 At one time Volcan Point was on the Sierra Clubs SDC list, but no longer, which is odd, because it is a publicly assessible summit and has one of the best views in the entire county. Surely it deserves a spot on the list ahead of more than half the summits on the current list. It was 9a by the time I had driven to the park entrance. Parking is found along Farmer Rd, just outside. Mine was the only car when I started, but there would be about a handful of others here by the time I was done. An artistic entrance made of wood and iron with Indian motiffs greets visitors at the end of a short gravel road. Beyond this the route becomes less ornate, following one of the ranch roads that serve for trails in the park. There is a singletrack trail of more recent construction that one comes across on the way up, the Five Oaks Trail, starting about half a mile up from the park entrance. I followed this very fine trail through oak understory and chaparral-lined hillsides. There are nice views of the Julian countryside along with interpretive signs and a bench found enroute. Those portions of hillside not covered in chaparral were sheathed in grasses, a lovely green this time of year. Overcast skies kept temperatures chilly most of the morning, but quite nice for hiking. The Five Oaks Trail rejoins the main road after about a mile at a junction and soon thereafter the mid-summit gate is encountered. It was here that I noticed the sign indicating the top is only open on weekends and major holidays. Perhaps someone is afraid the masses will run helter skelter over the mountain, getting lost or perhaps threatening the communication towers near Volcan Point. I took my chances and went over the fence (just as a note - there is a bypass to the right around the fence, but that has encroaching poison oak). From the mid-summit gate, it's less than a mile to Volcan Point, turning right at a major junction found north of the summit (signs indicate all other routes are closed). On the way to Volcan Point one passes by a sturdy rock chimney, the remnants of an observatory cabin that once stood here. At one time Volcan Point was on the short list to receive the Hale Telescope which eventually landed on Palomar Mtn. The cabin was manned for several years to observe viewing conditions throughout the year before being abandoned. All that remains of the wood structure is the chimney. The highpoint of Volcan Point is found in a rock outcrop amidst a cluster of oak trees fraught with poison oak. I couldn't located the benchmark, but did find one of the reference marks. Immediately north of the highpoint is an old, fenced-off tower that once served as a light beacon for navigational purposes by the overnight airmail planes. The highpoint itself hasn't much in the way of views, but by walking around the grassy slopes on either side one can get wonderful views looking across the Anza-Borrego Desert State Park to the east and south, and west across the county as far as the Pacific Ocean. It's really a great viewspot and deserves a place on the SDC list. Yet for all the fine views, Volcan Point is not the highpoint of the Volcan Mountains. That honor goes to Pechacho BM, about 5 air miles to the northwest. I had researched it enough to know that roads could get me most of the way there, but the route goes through a number of different properties not open to the public. There are alternate routes up from the east and west sides, but these have their own trespassing issues. The shortest route up from the west goes entirely through the Santa Isabel Indian Reservation. I had explored that route some years ago, but found outsiders were unwelcome and I never ventured out of the car that day. It would take about an hour and forty minutes to cover the distance between the two summits, roughly following the spine of the Volcan Mtns. There are two unnamed summits along the way, only one of which I recognized as such and went to the top. This was the antennae-topped Peak 5,380ft found only 3/4mi from Volcan Point. Its highpoint was a large, lichen-covered piece of granite tucked under an oak tree, sans views. Nothing of much interest there. I stayed on the various roads for most of the route, following through property owned by the Volcan Mountain Foundation and others. A sign tacked to a tree warned of mountain lion sightings in the area. All I could do was laugh. A truck came rambling up one of the main roads coming from the west carrying a couple of indians. I waved, they waved back, no trouble there. There are a few homesteads adorning the hillsides in the middle of the route, likely where the pair were heading. These aren't found directily on the route, but they are clearly visible and of some concern. My route came up against the edge of the Indian Reservation without quite crossing into it, as I reached a microwave tower at the end of the paved road. This minor summit was an odd one, the eastern half occupied by what looked like several dozen trailers. I couldn't tell if they were inhabited or just in storage, but didn't wait around to find out. I ducked down a little-used side road to the left (north), now overgrown but marked with an odd sign about a reforestation effort involving half a dozen organization both private and public. The sign looked fairly new, but placed in a location where no one, or certainly very, very few people would ever see. The last ten minutes to the summit were an easy cross-country affair, crossing into the reservation over a barbed-wire fence at the last minute. A wooden cross stood near and I noted a fair amount of ice chips covering the ground in places. It had been exceedingly cold the night before with fog and wind, freezing rain adhering to the pine needles of those trees growing along the crest. This ice had been blown off the needles during the morning, collecting like frosting on the ground below in the shadier places. I was unable to locate the Pechacho benchmark, most likely hiding under the thick forest duff or a clump of brush. Views were scant due to trees. With some effort in walking around them, I managed a view to the west and another to the northeast, but in general the summit was disappointing. On the way back out, just a few minutes before I was back on the county park property, an official vehicle carrying three park rangers came driving up the road. They didn't just drive on by as the others had, but stopped to talk with me. My response was an honest one when asked what I was doing. The female ranger who did the talking (while the other two just smiled) wasn't very happy with my excursion onto forbidden lands. She let me know that portions of where I was hiking were open during periodic, guided tours, should I care to check the information kiosk at the TH. I thanked her for the info and followed her instructions to head back to the park from whence I'd come. This wasn't the last I'd see of them. 45min later, when I was back near Volcan Point I spotted a party of six making there way past the observatory cabin site and heading to the highpoint. As I was chuckling to myself thinking, "How dare they violate the mid-summit gate closure! ", the same truck came driving up behind me. I waved again, but this time they simply drove past without acknowledgement. They stopped at the observatory site to unload some supplies (perhaps to reinforce the wooden fence around it), then drove on to confront the party heading to Volcan Point. Rather than stick around to see how that played out, I continued down the road to get back onto the legal side of the mid-summit gate as quickly as possible. It was 2:20p by the time I got back to the van, happy to be back without a citation or worse. Bob, at least you were bold enough to speak to the rangers. During my excursion I was constantly listening for vehicles and frantically jumped into the brush to avoid a couple confrontations! The only one I couldn't avoid was a couple residents who just waved and kept driving.